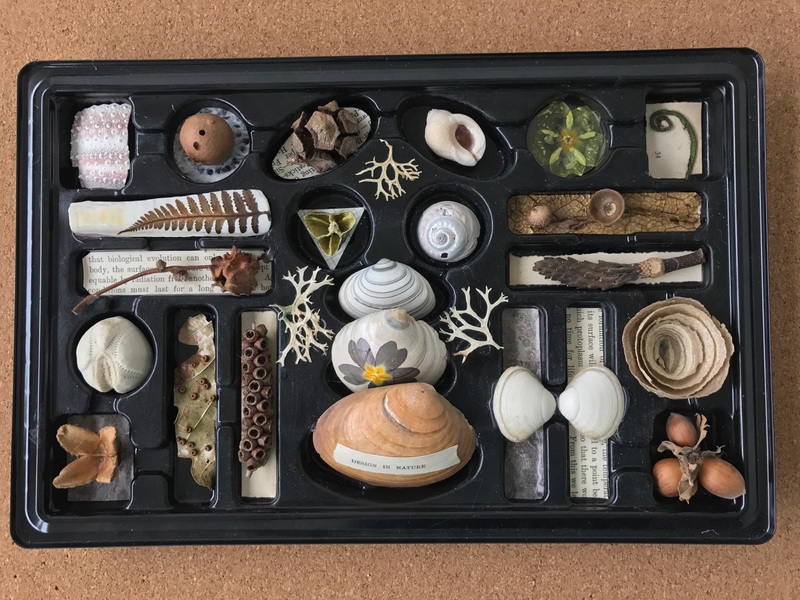 Many people ask me about suitable display boxes for their natural collections. There are lots of ways to display and it is something I get really into. Anything that already has dividers is great. we previously did a shell collection in an ice cube tray. One of my favourites is the Natural collection in a chocolate box insert. I have many items that I pick up on my wanderings. 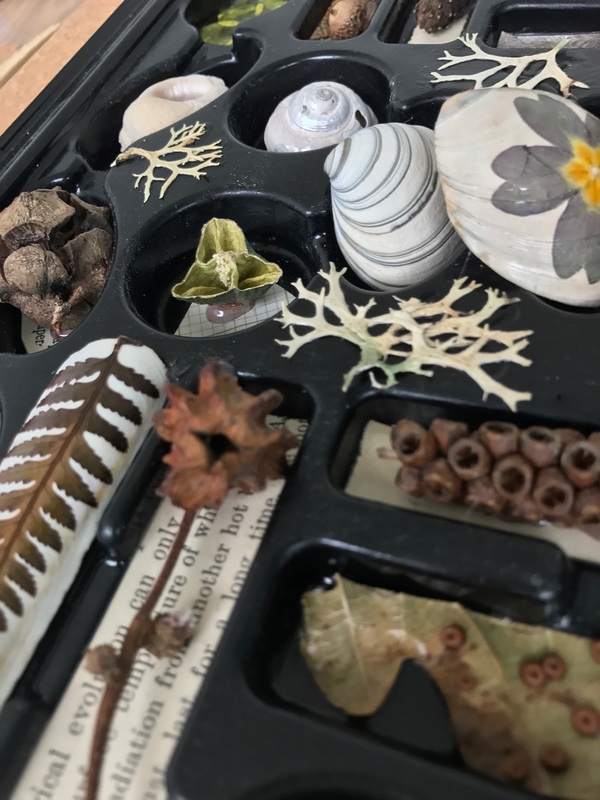 Acorn cups, shells, pressed leaves or flowers and stones of interest. I gather these things and so do my children so we have plenty of these hanging around the house! Rather than have them all jumbled on a windowsill I try to encourage a ‘display’ to emerge. This brings in an assessment that wouldn’t ordinarily exist. The narrative involved in displaying requires thought and critique. Any plastic insert from chocolate selection boxes work. They often have different shapes chocolate spaces which encourages an assessment of the item and which shape is the best fit. This is a simple exercise for younger children similar to shape sorting toys. At this stage a picked a few background textures and colours and roughly cut them to fit a few of the inserts. This is to have some inserts as a lighter background to show off the items better. It creates variation across the piece as a whole. Audition your items into each position. This process can last as long as you want it to. In these photos you can see that the long thin positions lent themselves well to a razor fish shell and small branch with acorn cups attached. From an aesthetic perspective you are sizing up each item with each position but also being aware of the overall visual of the piece as a whole. When assessing overall think about colour and texture. If using freshly picked colourful flowers, the collection may not last long but it will be photos that you will have of it to remember. 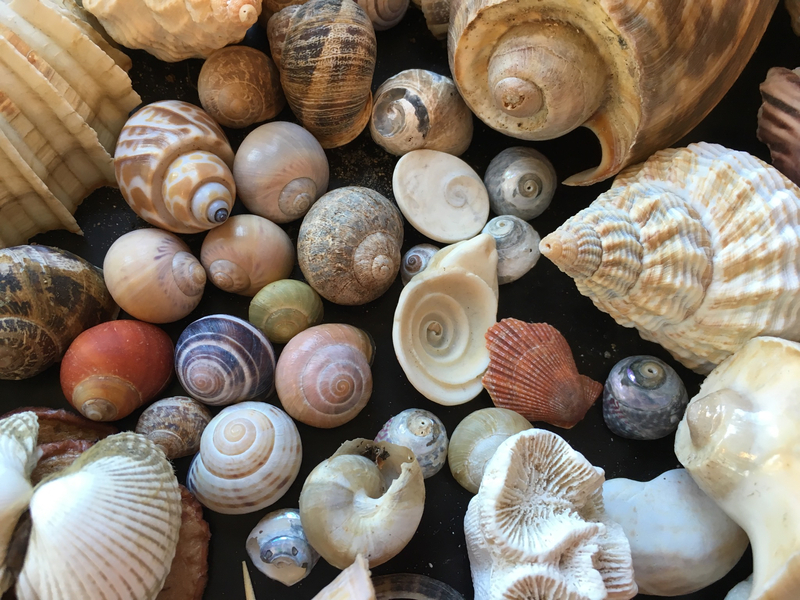 The collection pictured was mostly shells and forest pickings from last season, but I brought in a little brighter colours with the gluing of the pressed flowers onto shells. Once I was happy with the overall arrangement, I used a glue gun to stick the fix the items into place. Glue gun is fine for shells and sticks, but for more delicate items like pressed flowers I used a PVA based glue and allowed drying time. At this stage you can use a UV varnish if you wish. Or decorate with words cut from book pages which I love doing. I also filled in some of the last spaces between the inserts with a few pieces of pressed seaweed which added a nice filigree touch. You will know when you are finished and happy with it, and it could always make a lovely gift!